Sarah Moran reports in today's Daily Local News that "For the first time in 112 years, the Conard-Pyle Co.'s headquarters and most of its greenhouses are all in one place. 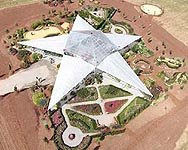 That's because, in October 2008, the company moved its containerized cuttings to a 3.25-acre state-of-the-art greenhouse that, as one approaches it, looks like a giant white and silver folded accordion. The company moved its headquarters to the new facility in March, and Steve Hutton, its 58-year-old president, couldn't be happier with the new location atop the verdant hills of southwestern Chester County." Read more.